Will the Ukrainian crisis freeze foreign investment plans for Siberia? 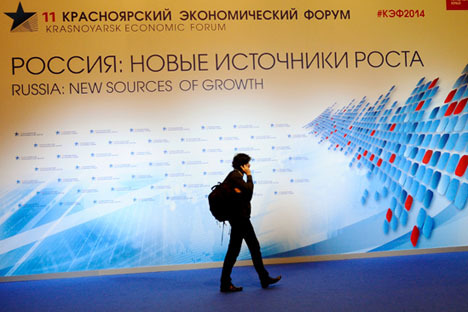 The U.S., Canada, South Korea and Japan are on the shortlist of the most likely partners to assist Russia in the development of Siberia and its Far East, according to participants at the 11th Krasnoyarsk Economic Forum, held on February 27 - March 1, says Russia Direct. Experts believe that the aggravation of the situation in Ukraine will not fundamentally impact the Russian government's plans, with the investment opportunities simply too attractive to be passed up by outside investors. Earlier, at a cabinet meeting on March 21, 2013, it was announced that Russia’s eastern regions would be the focal point of the country's economic development as a whole. This decision was dictated by the state of the global economy. “In the future, demand for raw materials will mainly come from South East Asia,” Professor Alexei Skopin, head of the Department of Regional Economy at the Higher School of Economics, told Russia Direct, highlighting the fact that Russia’s principal raw material stocks are concentrated in Siberia and the Far East. Experts agree that the most effective format for attracting investment in the development of Siberia and the Russian Far East will be to create Territories of Advanced Development (TADs). Since the mid-1990s, the country has been setting up Special Economic Zones (SEZs), of which there are now 17, most of them concentrated in the western part of Russia. But apart from six industrial zones, they have yet to have any real impact. Territories of Advanced Development (TADs) are essentially an upgraded version of SEZs, presupposing a wider range of preferences. The administrative body will also be different. SEZs are run by the Ministry of Economic Development, while TADs will be under the Russian Ministry for Development of the Far East. In other words, special economic zones (industrial parks, techno- and agro-parks, etc.) will be established in various regions to allow investors to set up new production facilities, including ones focused on exports. For this purpose, the areas will operate under special preferential conditions. A bill “on the creation of a territory of advanced social and economic development in the Far East” has already been submitted to the government for consideration. The format of TADs has been successfully tested in China, Singapore, India and Myanmar. Now the Ministry for Development of the Far East is analyzing the region to determine the most suitable sites to create these special territories. Experts are presently engaged in open talks to identify the optimal set of preferences needed to attract investors to these special territories. For instance, Minister for Development of the Far East Alexander Galushka proposes, on top of tax breaks, to simplify the administrative procedures for obtaining licenses, whether they pertain to construction permits, customs rules, or technical regulations. The need to simplify the legislation is reiterated by Vladislav Inozemtsev, scientific director of the Center for Post-Industrial Studies. But his formula for Siberia goes even further and proposes to open up Russia’s resources to investors. Public-private partnership is hailed by experts as the most effective business format for developing these territories. Professor of the Higher School of Economics Sergei Karaganov suggests developing those industries in which Russia has a competitive advantage. They include: agriculture, petrochemicals (in particular, the production of chemical fibers), deep timber processing (in particular, the production of paper and cardboard for export to Asia), energy-saving technologies, water supply, and water treatment. Will the Ukrainian crisis impact future investment strategies? Inozemtsev lists Japan and South Korea among the potential partners for Russia’s development of Siberia and the Far East. Investors from the U.S. and Canada could also be brought in. These countries have vast experience of developing areas under similar economic conditions to those in Russia. Yet relations between Moscow and Kiev, in the opinion of various experts, will not hamper the future development of Russia’s eastern regions. The potential plans of U.S. investors are not so large-scale as to have a dramatic impact on the political situation, says Vladimir Klimanov, head of the Department of State Regulation of Economy under the Russian Presidential Academy of National Economy and Public Administration (RANEPA). “The share of American and European investments in projects in the Far East is likely to be small: just a few percent, maybe not even ten. The bulk of the investments will come from Japan (if we manage to reach an agreement over the Kurile Islands) and China. The latter has made it clear that it adheres to a neutral position with regard to the Russian-Ukrainian situation,” expounds Alexei Skopin. Will the Ukrainian crisis impact future investment strategies? Read more experts’ opinions in the full version of the story at Russia Direct. Russia Direct is international analytical media outlet with the focus on foreign policy. Its premium services, such as monthly analytical memos and quarterly white papers, are free but available for subscribers only. For more information about the subscription, please visit http://www.russia-direct.org/subscribe.